In college Robert majored in Psychology with a minor in Dance. His goal was to become a Movement Therapist. He spent the next 25 years designing and manufacturing jewelry but in early 1999 decided it was time to resume his journey. Robert has studied with some of the world’s greatest yoga teachers. He loves the movement, fluidity, and meditative quality of Flow Yoga but has learned to balance those qualities with structure and alignment. He has experienced his share of injuries and physical challenges and they have made him a more compassionate teacher and driven him to continually study and refine his skills and increase his knowledge. Over the years, he’s learned that yoga is an ever evolving practice. 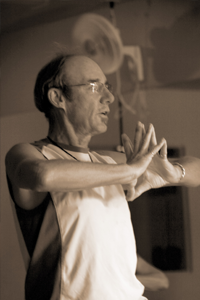 He shares his passion of yoga exuberantly with his students and clients. He focuses on teaching classes that are accessible to all, while still challenging they will sustain you easily into your golden years. Yoga Fit, thanks to Beth Shaw for introducing me to Senior and Kid’s yoga teaching techniques. A special thanks to John Friend for teaching me the importance of foundational yoga teaching techniques and to Tracey Rich for just being.